From 11am a steady stream of visitors wandered through the theatre, learning about the history of both the monuments and the Trust, talking to Trustees, inspecting and handling artefacts from prehistoric and Saxon times, finding out about astronomy at the monuments and the mystical art of dowsing. A series of short films running in the auditorium allowed people to relax with a hot drink or tipple from the busy bar and learn more about the Rollright Stone monuments from prehistoric times through the Shakespearean era and listen to expert opinion from professional archaeologists - ending with a wonderful animation of the Witch and King fable. George Lambrick, chairman of the Trust formally opened proceedings and presented a talk about the Rollright Stones detailing the trials and tribulations of looking after historic places for public enjoyment. George also launched the new Rollright Stones web site and his new Rollright Stones guide book - a 'must have' for anyyone interested in local history. Continuing with the management theme, Ruth Peters, now in charge of nearby Chastleton House, gave everyone a terrific insight into the management of one of the UK's most interesting historic buildings. Professor of Archaeology Tim Darville from Bournemouth University gave an entertaining, comprehensive and eye opening insight into the many wonderful Cotswold Megaliths we have in the area. Professional archaeologists Annie Byard and Helena Hamerow finished the talks in style and held the audience captive with the description and update on the Saxon lady skeleton that was unearthed close to the monuments in 2015. The evening finished with a rare showing (on the big screen) of the captivating and visually stunning documentary by Werner Herzog 'Cave of Forgotten Dreams', neatly merging the disciplines of archaeology and art together, in the perfect setting of the Theatre. 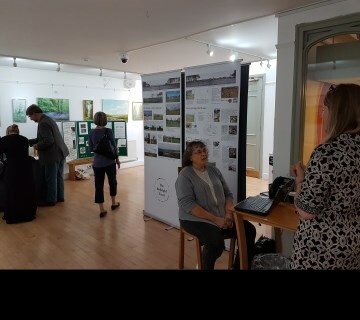 It was the most successful day the Rollright Trust could have wished for, and the level of support and interest from the public could not have been better. 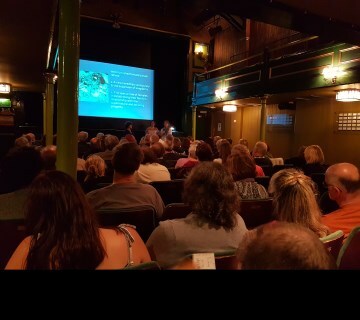 It was only the first of several events hosted by the Trust for its 20th anniversary celebrations, and everyone is urged to keep a close eye on the new website www.rollrightstones.co.uk for all future events.